Cameo glass is a form of glass art that is produced by etching and carving through fused layers of different colored glass to produce wonderful designs. This is usually done with white opaque glass figures and motifs on a dark-colored background. The technique was first seen in Roman Art of around 30 B.C. The glass medium allows consistent and predictable colored layers, even for round objects. In the mid-19th century there was a revival of cameo glass, who doesn’t love the the French Art Nouveau practiced by Emile Galle and the pieces signed Duam Nancy. 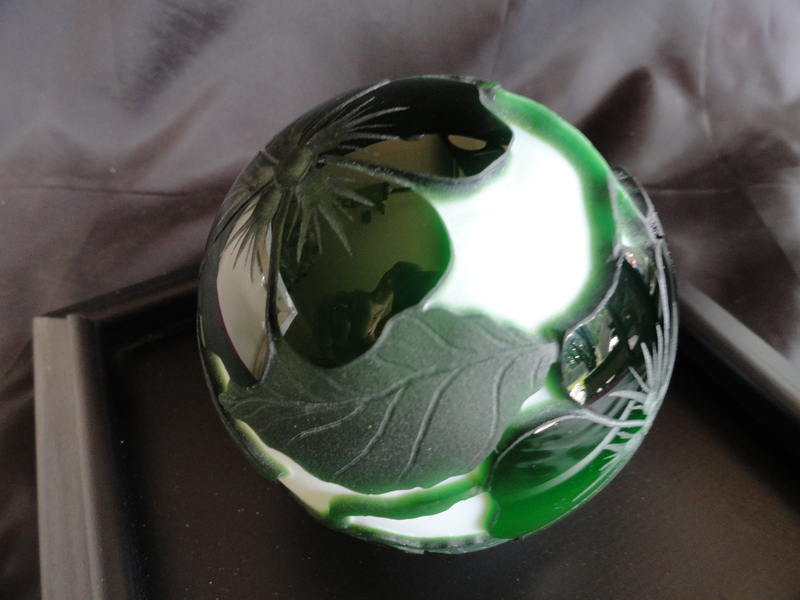 I could spend days looking at Galle and Nancy cameo glass pieces but the Cameo glass I want to introduce you to are the Cameo Paperweights that have been made in the past 25 years (known as modern paperweights) and are still being produced today. In the modern revival of cameo glass paperweights all of the top layer except the areas needed for the design are usually removed by an etching process — the figure areas are covered with a resistant layer of wax or some other acid-resistant material such as bituminous paint, and the blank repeatedly dipped in hydrofluoric acid, so that cameo glass is in some sense an acid etched glass. Some artist use a sand blasting technique. The detailed work is then done with wheels and drills, before finishing, and usually polishing. It seems that in the ancient world the entire process of removing the unwanted white or other top layer was done by drills and wheels — wheel-cut decoration on glass of a single color was very common in ancient Rome. In the case of “three-layer” (or three-color) cameo, there is another layer of glass on top of the white opaque one, and further layers are possible. One Roman piece uses a record six layers. It is not known where the ancient pieces were produced, but for want of any better suggestion most scholars think it is likely that at least the making of the blanks was initially in the hands of imported Syrian glass-workers. Some of the more common pieces found today are works by Barry Sautner. 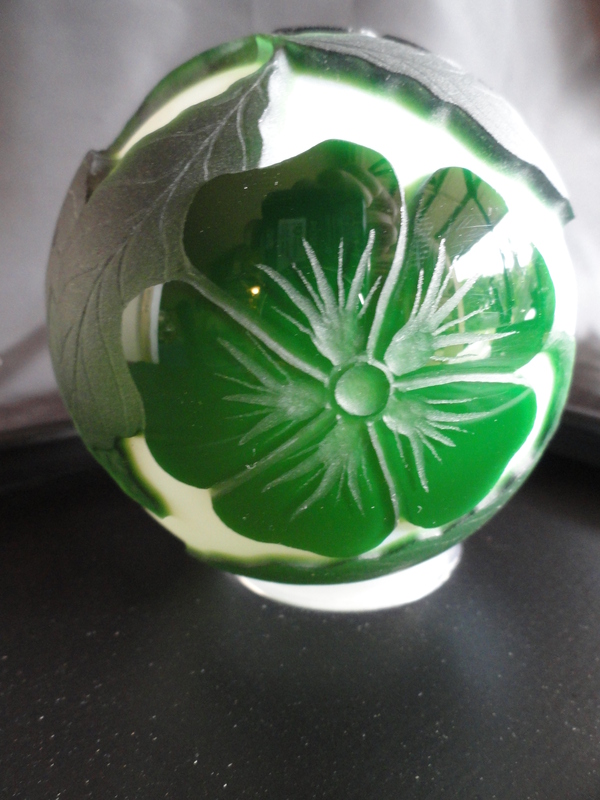 Also pieces by Kelsey at the Pilgrim Glass Studio are very familiar to collectors of cameo glass paperweights. 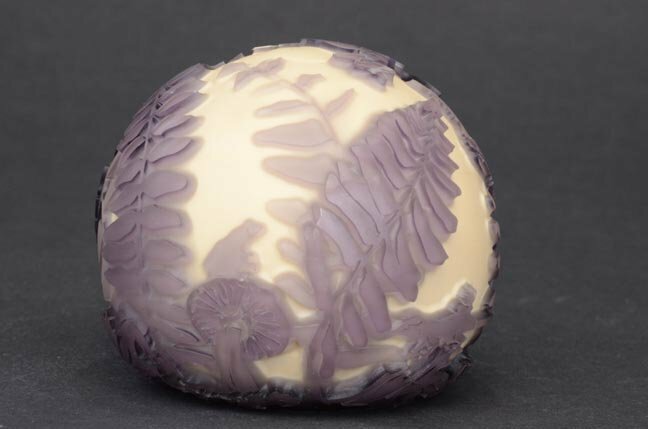 A beautiful cameo paperweight done by Barry with retail value listed at $9000.00. This is known as the “Lily” Sautner weight. Made at the Sautner Glass Studio in the 1980s. 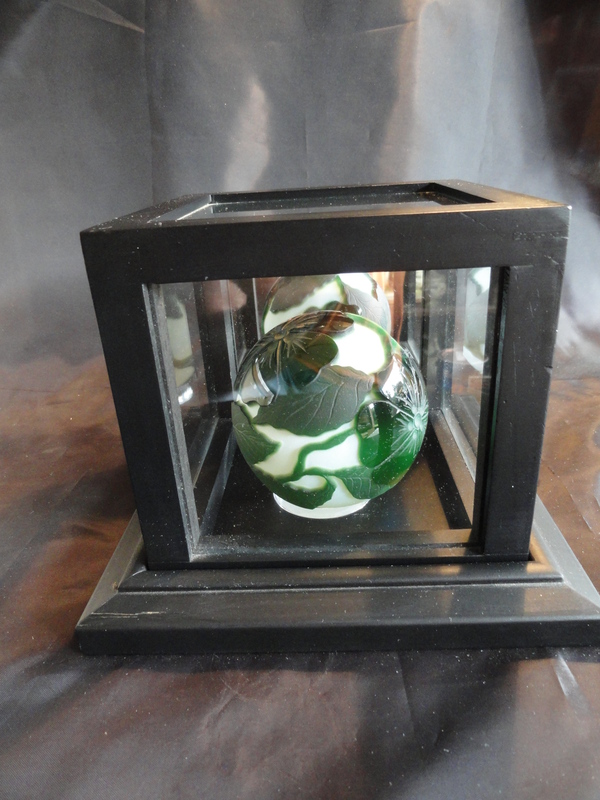 Vandermark-Merritt 1982 green cameo cut glass paperweight by Barry Sautner. Retail value $1200.00. Barry R. Sautner, a nationally recognized glass artist, formerly of Flemington, passed away suddenly on June 30, 2009 at his home in Vero Beach FL. He was 57. Barry was born to Elva and Alfred C. Sautner in Philadelphia in 1952, and later moved to the Flemington area, where he lived for nearly 30 years before relocating to Florida. His background as a glass-blower in New Jersey for nearly 10 years was fueled by a passion to explore glass as a means of artistic expression. But after an illness forced him out of the sweltering heat of the furnace room, he found he had artistic visions yet to be fully realized in glass. Beginning with shallow surface relief designs, Sautner continued to test the depths of the glass. The deeply undercut methods of the Romans were catapulted into the modern age, as the artist introduced a sand-blasting method of his own, called insculpture. Using his invention, he could hollow out an interior image in clear glass blanks. This resulted in infrastructures, previously thought to be impossible. But Sautner saw the image inside, and revealed it to be possible. 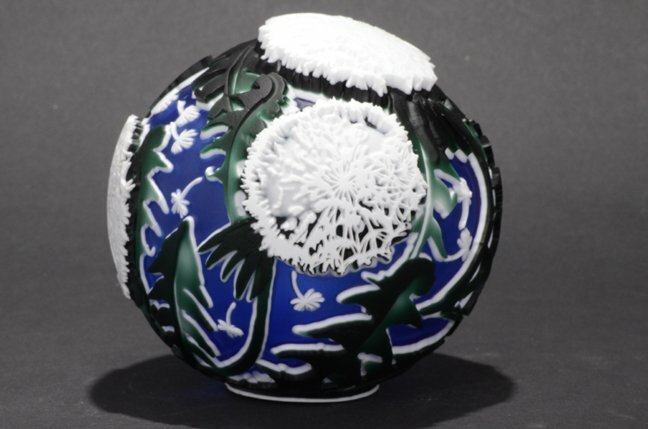 It is a remarkable skill to visualize and create an artwork in three dimensions, and the extractive methods Sautner had made his own, amaze even the most well-versed in glass art techniques. Technique aside, however, the complex, personal symbolism of Sautner’s artwork seems more daunting. He kept notebooks to record dreams at his bedside, thoughts that rushed to him at odd moments in the day. Sautner’s willingness to explore monumental themes: emotions, philosophies and life transitions, speaks to people because his art’s scale is approachable and intimate. The proximity of the viewer to the piece creates an exchange on a personal level. Inspired as he was by the delicacy of ancient Roman diatreta, and the demure qualities of cameo carving, one can immediately appreciate Sautner’s skill. The complex framework of the works shows balance and sophisticated sculptural sensibilities, but their fragile nature belies their poise. Sautner removed layers, uncovered truths, and carved so deeply into this glass skin, one may see a tremulous heartbeat in each piece. My inlaws live in Vero Beach Fl and while visiting my wife made a trip to the Sautner Studio. She just went on and on about it. I can see why. 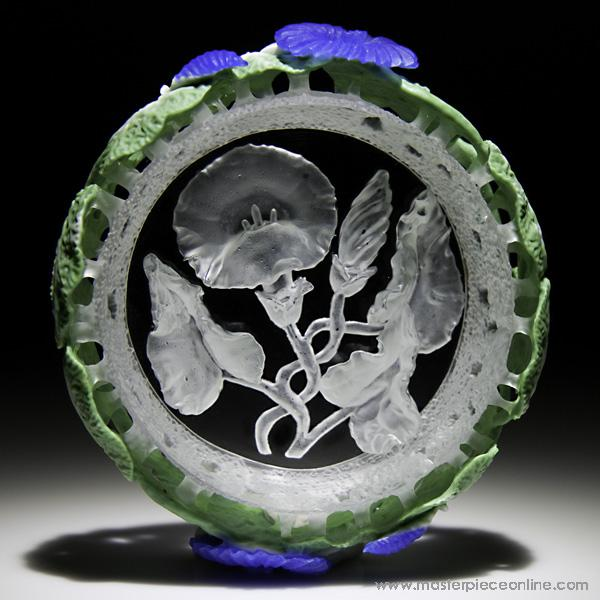 Under the direction of Kelsey Murphy, Pilgrim Glass introduced a line of cameo glass in the 1980’s. Cased glass is carved through a sandblasting process, to reveal the desired color and design. The designs are Murphy’s own pictorial scenes. All pieces are signed by Kelsey. Most are issued in limited editions and numbered. Check out these pieces being offered at an on-line auction as well as prices actually sold for (after 4/15/2012). Titled “Crowning Wish”. This is a 5 color cameo, very difficult to make. Signed by Kelsey Murphy. Retail value listed at $4000.00 to $7000.00. Titled “Fall Gum” . This is a three color cameo signed by Kelsey Murphy. Retail value listed at $2000.00 to $3500.00. This is a 2 color weight called the Fern weight by Kelsey Murphy with a listed retail of $400.00 to $700.00. I have tried to show you at least three of the different priced Kelsy cameo weights so that you have an idea of the values as compared to the amount of work and the rarity of the peice. One thing for sure is that there seems to be an abundance of the Pilgrim Glass Studios work marketed. However, since they are closed that may not last long. If you want such a weight NOW is the time to buy it! You can attend an online auction on April 14, 2012 at this address: http://www.liveauctioneers.com/catalog/29022_kelsey-murphy-cameo-glass-auction/page1 or you can check after the sale date to see what the pieces actually sold for. Another interesting cameo artist I have found is Joye Colbeck. Joye is a glass artist located in the UK. On a recent weblog I found the following info that she shared with us. (quote) “I make my work infrequently and make for my own enjoyment. Many glass artists are quitting due to the high prices of fuel and the worldwide recession, but I’m hanging on in there because I love the process too much to see sense!. I intend to make a living from glass making again someday but since a motorbike accident I’ve struggled with a very painful arm. 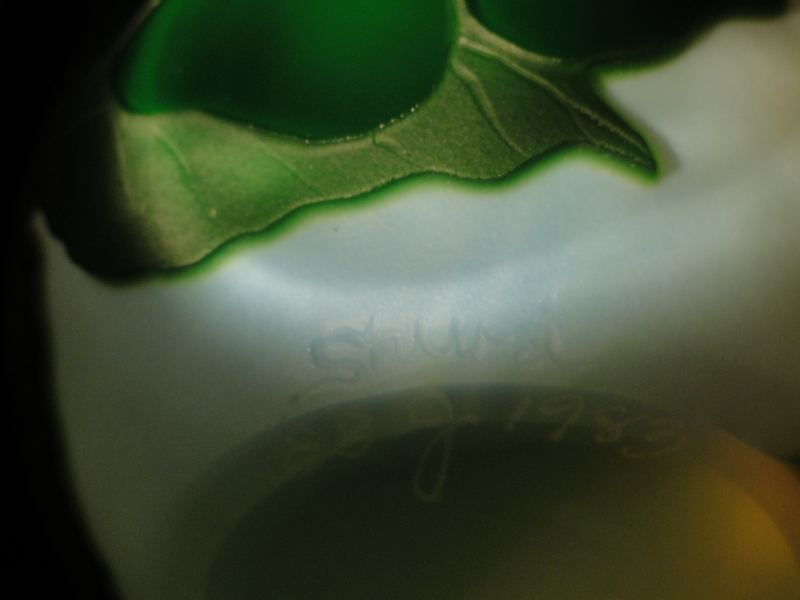 I blow cased vessels which are then etched to leave the design in relief on the surface. I put my pieces on sale, I’m always hoping to cover the cost of my materials, if they go for more then it’s something towards my time. If you like my work, pay what you can to support my future endeavors. I am in the process of setting up my own website to share more of what I do. Recent shoulder surgery has delayed this but I’m on the mend so it shouldn’t be long now. It has also kept me from the glassmakers chair thus the need to blow and feel the heat of the molten material is spurring on my attempts at recovery”. I have purchased, owned and sold a few of the Colbeck weights. They are certainly cameo in nature however probably more of a carved weight using a sandblasting technique. I love her work. She is just great! SOLD! 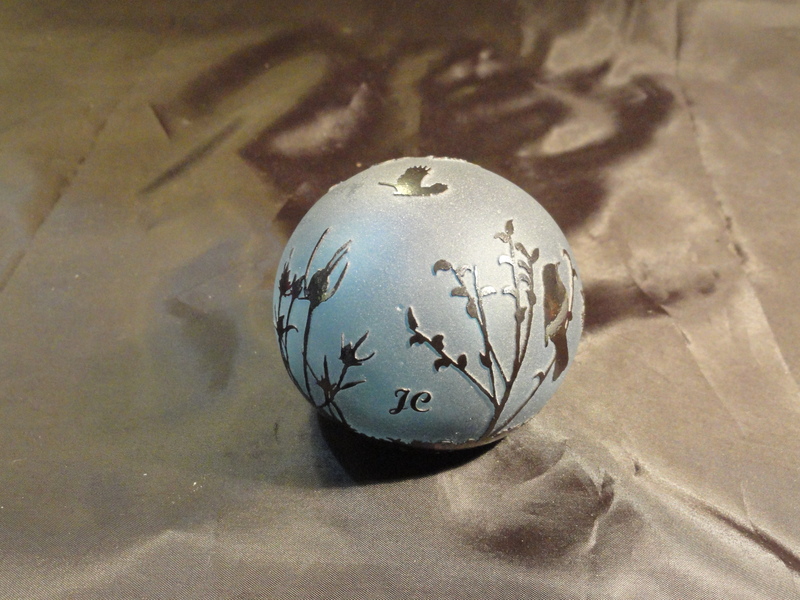 This was a beautiful Blue glass weight of birds and trees hand carved and signed by Joye. Made of purple glass and then hand carved. Signed on the base in script Joye Colbeck, PPWT2, 2/50, 2009. Currently listed in my eBay store Kelekchens. I hope Joye is well and continues to make her excellent weights however I have not seen anything recently made or listed for sale. They may be now hard to find. Check for yourself. As many of my followers and readers know, I do collect paperweights and have a fairly substantial collection of glass weights. My collection mostly is of American artist from the 1970s – 1990s. I have always been a huge fan of Orient & Flume, Lundberg Studios and Lotton Studios to name a few. I love the aurene and irridescent styles that were made by these studios. 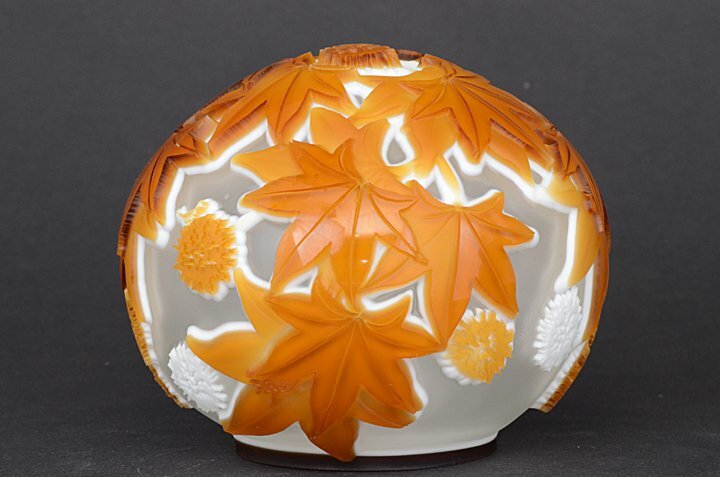 I have tried to write a pretty exhaustive article on Orient & Flume paperweights simply because it is an interesting story and the O&F studio contracted so many artist over the years. I continue to add to the Orient & Flume blog with new purchases and new sales. Even after 35 years of collecting and paying attention to Orient & Flume’s work I still get an occasional surprise, and here is another. I never considered that O&F would have a cameo glass weight. In a dust free case. Of course! Ahh! There it is! The detailed carving of the surface ie; leaves and flower petals was done with a scrimshaw tool, by hand. 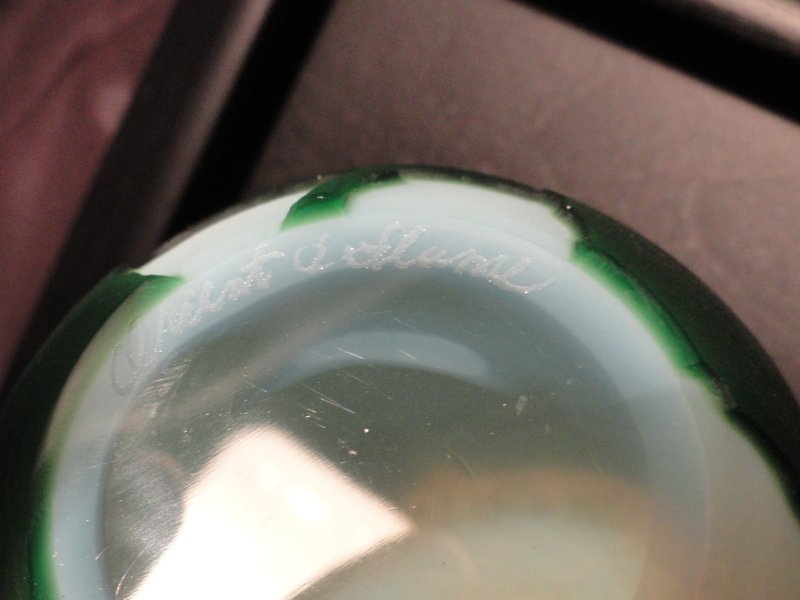 This is actually a three color cameo (two greens on white base) that has also been hand worked and polished. All exquisite hand made glass details. Having collected the Orient & Flume weights for a very long time this is the very first O&F Cameo Glass weight I have seen. Unlike other studios that I have listed above who have focused specifically on cameo weights this one is a rarity! 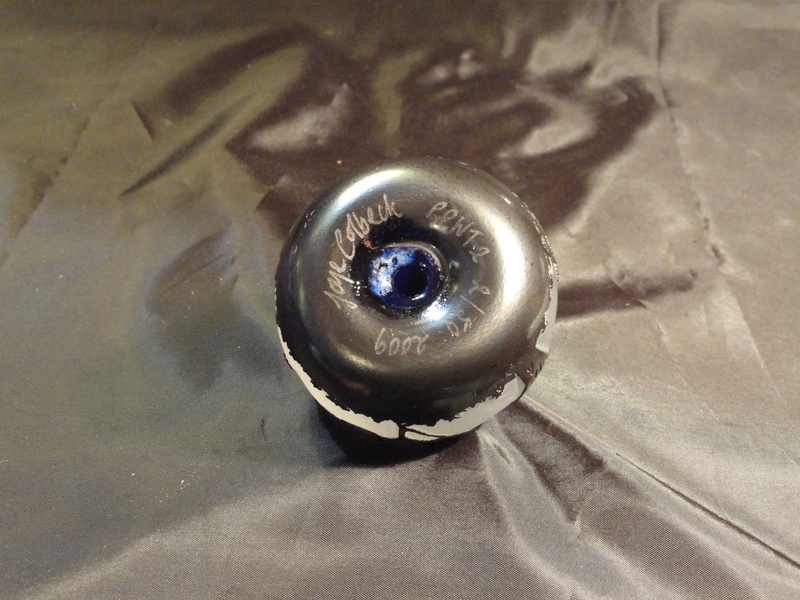 A very unique paperweight done by Dan for Orient and Flume. If you would like to know more about Dan Shura be sure to read my previous blog on Orient & Flume. Also, be sure to look at two weights that are currently for sale at the official O&F website. Current retail prices are $2500.00 – $3000.00. Go here: http://www.orientandflume.com/Categories/Paperweights.aspx?sortorder=1&page=4 Listed as the Engraved Fox and the Engraved Wren. 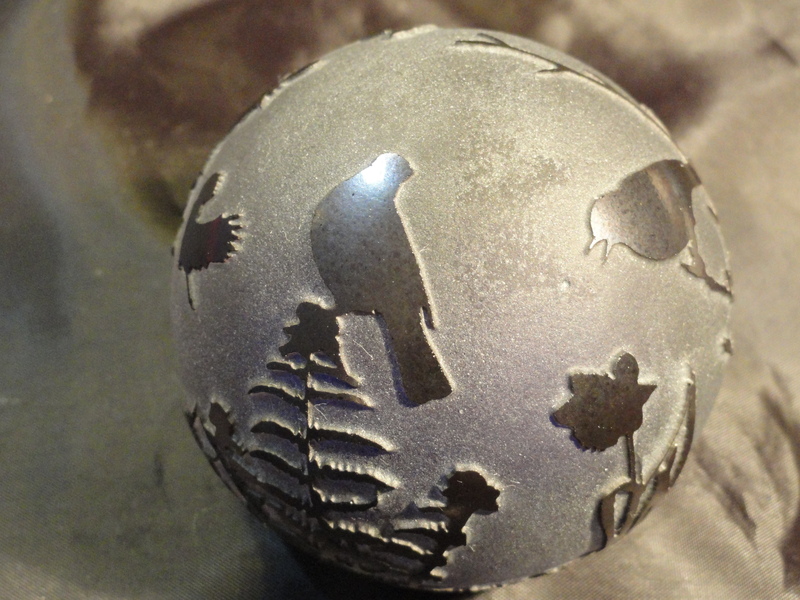 You can find this Orient & Flume paperweight done by Dan Shura in my eBay store. Put your cursor on my assistant, the Duck, double click and you are there. Thanks for reading my blog and until next time Happy Collecting and remember “The best is yet to come”.